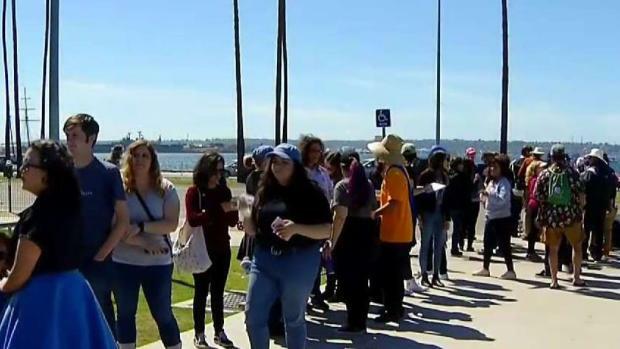 Senator Bernie Sanders brought his 2020 presidential campaign to California, kicking off a weekend of free events with a Rally at Waterfront Park in San Diego. The two-time presidential hopeful launched his bid on a Vermont radio program in February and said he plans to continue championing for progressive proposals like universal health care, a $15 minimum wage and to reduce student debt. Sanders echoed those campaign points at Waterfront Park. He reminded San Diego that President Franklin Delano Roosevelt gave a speech from the exact same spot and championed for economic rights in addition to political rights, like the right to a job and the right to health care for all Americans -- points which Sanders said he agrees with. A crowd is gathering at the Embarcadero in anticipation of Senator Bernie Sanders's stop in San Diego. NBC 7's Erika Cervantes has more. "And that is why today, we say to the private health insurance companies, whether you like it or not, the United States will join every other major country on earth and guarantee healthcare to all people as a right. All Americans are entitled to go to the doctor when they're sick and not go bankrupt after staying in the hospital. We will no longer accept the absurdity of paying almost twice as much per capita on health care, while we have a lower life expectancy and worse health care outcomes than many other countries," the senator said. Sanders went on to criticize the imbalance between costs paid by customers and revenues taken in by health insurance companies. "We will pass a Medicare-for-all single-payer program. Health care is a right, not a privilege," Sanders said. Sanders didn't spend much time on tuition and student debt relief but did vow to make public colleges and universities free. "Today, we say to our young people that we want you to get the best education that you can, regardless of the income of your family. Good jobs require a good education. That is why we are going to make public colleges and universities tuition-free, and substantially lower the outrageous level of student debt that currently exists," he said. Sanders said he's been criticized for proposing a federal minimum wage increase, but said he will keep fighting for what once seemed like an "impossible dream." Today, we say to Walmart and other low wage employers: Stop paying your workers starvation wages. Yes. We are going to raise the federal minimum wage to a living wage - $15 an hour. Nobody who works 40 hours a week in this country should live in poverty. And yes. We're going to make it easier for people to join unions, not harder. "Four years ago, when we talked about the idea of a $15 an hour minimum wage, it seemed like an impossible dream. Well, since then, we have successfully pressured Amazon and Disney to raise their minimum wage to $15, and just today Costco raised its minimum wage to $15 an hour. We have also seen five states, including California, pass $15 an hour legislation and, just a few weeks ago, the U.S. House Committee on Labor and Education reported out a bill that will raise the federal minimum wage from $7.25 an hour to $15 an hour. And, I believe, that bill will pass the full House within the month," Sanders said. In response to the candidate's visit, the chairman of the Republican Party of San Diego County issued a statement criticizing Sanders and calling him a socialist. "As a naturalized citizen originally from Sweden, I'd like to remind Bernie Sanders that Sweden is not socialist. For example, it has lower corporate tax rates than the United States, offers school choice, and has no death tax." "We remind our fellow citizens that a government big enough to give you everything you want is a government big enough to take away everything that you have. America will never be a socialist country," the chairman wrote. Next, the Vermont senator will travel to Los Angeles for a rally at Grand Park across from Los Angles City Hall, 200 N. Grand Avenue, at 2:30 p.m. on Saturday. RSVP here. The California tour will wrap up in San Francisco on Sunday with a 12:30 p.m. rally at Great Meadow Park at Fort Mason, Bay Street. RSVP here. Sanders challenged Hillary Clinton in the 2016 Democratic primary. He became renowned for long, impassioned stump speeches in which he railed against political corruption. One of those rallies was held in San Diego County's National City but his campaign was accused of failing to pay for the event. 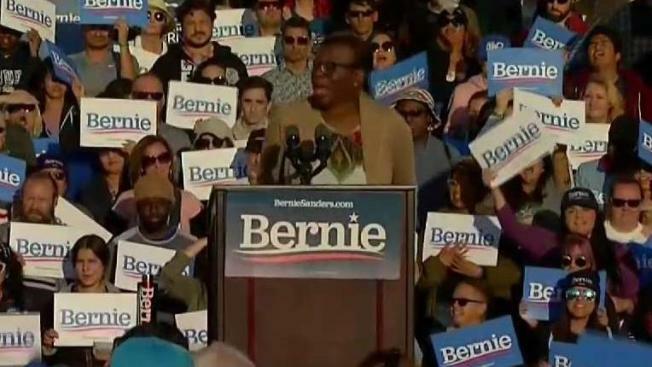 More than a year after the rally, National City Mayor Ron Morrison told NBC 7 the Bernie Sanders Campaign still owed the city more than $31,000. After several attempts to reach the candidate, a collection agency, on behalf of the city, filed a lawsuit against the campaign in Vermont. Payment was received in Oct. 2017, nearly a year-and-a-half following the May 2016 rally, according to the city. The race for the Democratic presidential nomination is already filled with a dozen candidates, including New Jersey Sen. Cory Booker, California Sen. Kamala Harris failed Senate candidate from Texas, Beto O'Rourke.